Fashion Herald: Esprit Closing: It's Not "Goodbye," It's "Hope to See You Later"
Esprit Closing: It's Not "Goodbye," It's "Hope to See You Later"
Word hit the streets yesterday that Esprit is planning to close all of its North American stores. 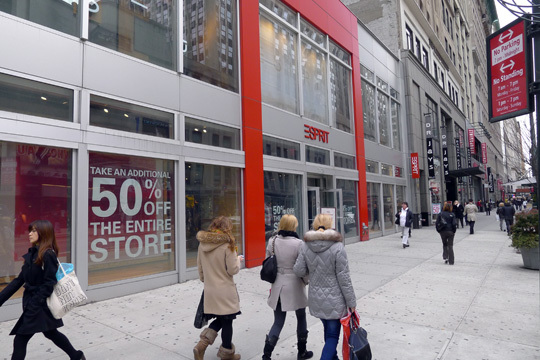 I read the news this afternoon while shopping Esprit on 34th Street. Seriously, I'm not joking. I was in the store checking my iPhone and got an email from Intern Craig. Really, he should be on the payroll, he's always keeping me in touch. Oddly I had just been thinking that the current sale (50% off the entire store) felt a little sad (see signage above). But I like to look on the good side: Esprit is regrouping, hiring new designers in Europe, and is rediscovering its "soul." I'm kind of freelancing on the latter, as that's what I want Esprit to do. Perhaps it'll be back in the future with its awesome, old-school-Esprit image intact. Good luck, Esprit, you'll always have a special place in my heart thanks to years spent pouring over your catalogs. Esprit was a big part of my early teens. I hope they get it together and re-open stores. I'd like to see them succeed in whatever market they choose. I'll always be nostalgic about Esprit. There was a mini "Esprit Shoppe" in the main department store of my youth. I spent much time there. I hope the company thrives. It's funny, we all want to see them do well! Such a big brand for those of us who knew them as teens. Went to Esprit yesterday and found out all stores in the USA are closing . I'm am so sad to see them go because I have been buying their clothes since I was a teenager. It's funny many things have changed since I was a teenager, but my love for esprit has not. It is sad that a company that actually has quality design and materials cannot succeed in the US market, instead companies like H&M and forever 21 that are cheap and cheaply made are thriving. I can't imagine finding another store I will love so much, and I will just remain hopeful that esprit will one day come back to the US market after getting the company back to what it used to be.